Dr. Vineeta Mohindra graduated from the Mahatma Gandhi Institute of Medical Sciences, Wardha, India and specialized in Obstetrics & Gynaecology. She has three decades of experience in the field of Obstetrics and Gynaecology. She has worked in large leading multi-specialty centres and offered surgical and non-surgical care options for a host of women health related issues including high risk pregnancies. She joined the Indian Navy in 1990 and served in various Naval Hospitals as a Specialist. She served in INHS Asvini, Mumbai, a tertiary care hospital for over a decade. She has been trained in Laparoscopy and Hysteroscopy. Her areas of special interest include Assisted Reproductive Technology and Colposcopy. She has set up and successfully managed IUI lab as a part her work and has been a Post Graduate teacher of Mumbai University and MUHS, India. She has published many articles in national indexed journals in India. MD and Residency Obstetrics & Gynaecology: Mahatma Gandhi Institute of Medical Sciences, Wardha, India. Specialist in Obstetrics & Gynaecology: Armed Forces Medical Services, India. Commander-in- Chief, Eastern Naval Command, India, commendation for meritorious service. Consultant, Obstetrics & Gynaecology: Private Hospitals in Pune. Specialist ( Obs & Gyn ), DHA : Lifeline Hospital, Dubai. Gynaecologist: Dr Amal Alias Gynaecology and Fertility Centre, Dubai. Colposcopy – Diagnostic and LLETZ procedure. Contraception and Reproductive Endocrinology including PCOS. Management of Gynaecological Disorders including Fibroids, Endometriosis and Uterovaginal Prolapse. Antenatal Care including Early Pregnancy Loss and Recurrent Pregnancy Loss and Ectopic Pregnancy. Management of High Risk Pregnancies. Conducted TVS Course at SKNMC, Pune In Oct 2012. Attended Live International Endoscopy Workshop at SKNMC, Pune in Feb 2012. Attended Colposcopy Course at SKNMC, Pune in Aug 2011. Faculty For Colposcopy Course at SKNMC, Pune in 2012. Attended Endoscopy Update at AFMC, Pune in Aug 2011. Attended Live Endoscopy Workshop at INHS Asvini Mumbai July 2010. Attended Annual Conferences of MOGS (Mumbai Obs & Gyn Society) from 2001 onwards. Attended 4 Weeks Art Course At Bombay Hospital in Oct 2001. Underwent Laparoscopy Training Under Dr PG Paul in 1995 (Jan To Mar-12 Weeks). 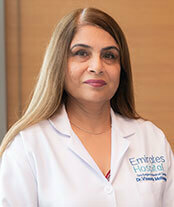 Visit our family at EHDSMC and get to know more about Dr Vineeta and how she can cater to your health needs.